Today: If you have bread and a touch of creativity, you're only a hop, a skip, and a jump away from bread pudding -- no recipe required. Bread pudding is a dessert born of desperation. When you fuse those two defining characteristics -- endless versatility and frugal adaptability -- bread pudding truly is the ultimate dessert. It's also 99% guaranteed that you have all the ingredients to make it right now, without a recipe. Go to whatever place you keep your bread and peek in -- what do you see? A luscious loaf of brioche? Some dried-out slices of Wonder Bread? A few croissants (you should be so lucky)? 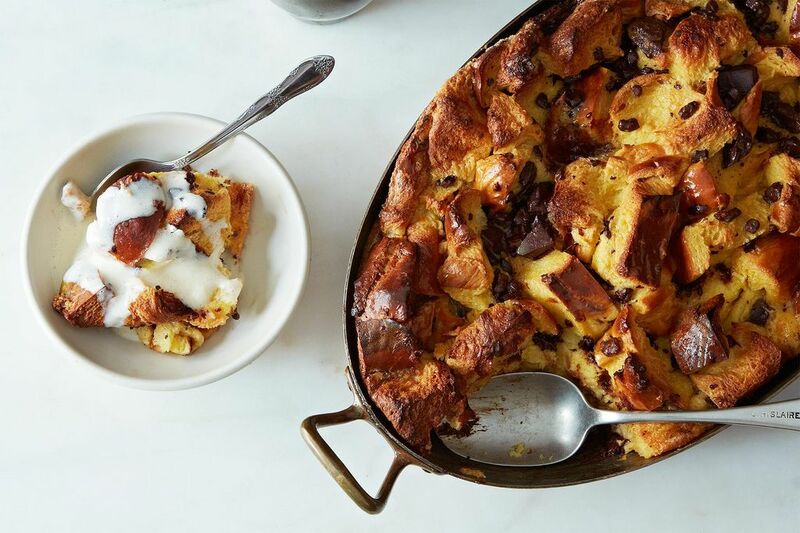 As long as you have some sort of bread-like product, plus eggs, sugar, and milk, you have bread pudding. 1. If your chosen bread (or bread-like object) is still fresh, don't fret -- you can still use it as-is. However, if you want maximum absorption powers, feel free to cheat time and stale it yourself. When slicing your bread, aim for uniform size. These chunks will be the building blocks of your pudding, so you want them to cook and absorb evenly. More: Got more stale bread than you know what to do with? Here are some inventive ways to use it. 2. Next, mix up the binder: the glue that unites, and flavors, your bread. And as with all (all right, most) good binders, we start with eggs. For a full loaf of bread, I go with 5 to 6 eggs; there's no hard-and-fast measurement here, you just have to use your own judgment. Don't worry too much about this step -- the bread will absorb most of the liquid you give it, and whatever's left at the end you'll just pour over the top. 3. Next comes the sweetener. I opted for Plain Jane white granulated sugar, but feel free to take a walk on the wild side and sub in molasses, brown sugar, or maple syrup. For 6 eggs, I used one cup of sugar, but the amount depends completely on your tastes. 4. Next, add in your milk-like liquid. You really shouldn't use anything with less fat than whole milk. 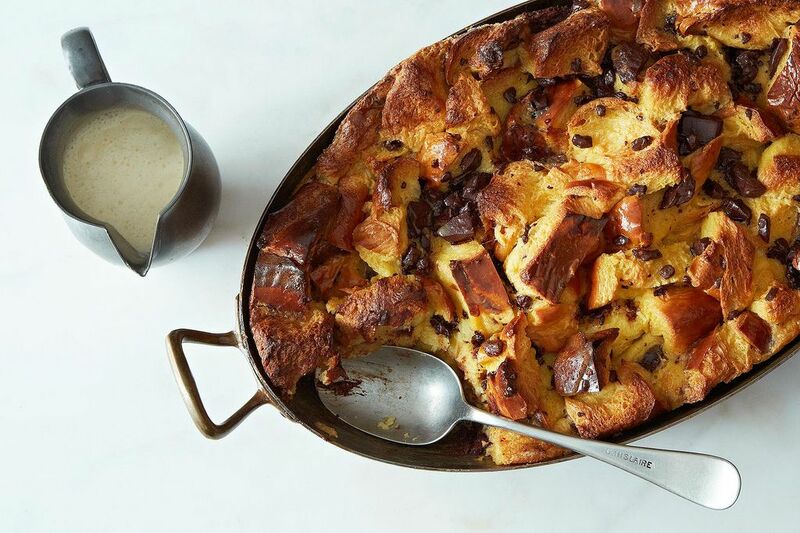 You're already making bread pudding, for goodness sake, you might as well do it right. If you want to up the indulgence factor, feel free to swap out half the milk for heavy cream. If you want to be everyone in the entire world's best friend, switch out some of the milk for melted ice cream. If you're avoiding dairy, almond and soy milks are also fine substitutes. 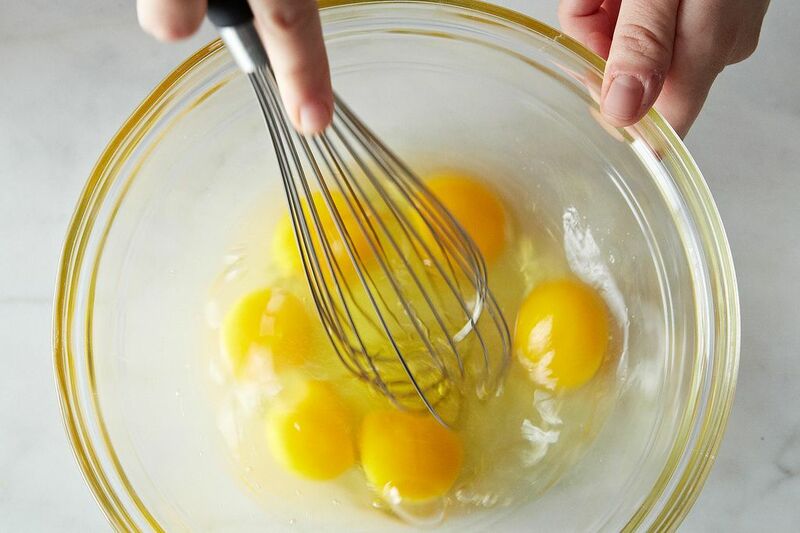 You want the amount of milk-like liquid to be about equal to the amount of beaten eggs. 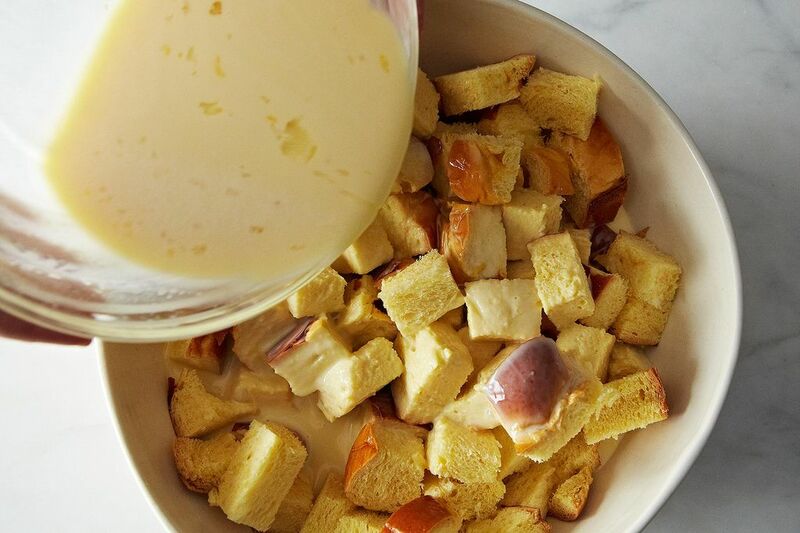 If you want your bread pudding to have a more custard-like texture, add in less milk. If you prefer it gooey, add in a bit more. 5. Now comes the really fun part -- that's right, we're talking mix ins! Bread pudding is a very personal thing, and you must figure out which flavors and textures most speak to you. For now, I can only tell you how I do bread pudding my way. To start, I added in about a shot's worth of bourbon -- that way you sense a caramelized, rich flavor in the background of each bite, but don't actually detect the booze itself. If you're not a bourbon fan, or are, God forbid, OUT OF BOURBON, Grand Marnier or dark rum are also good options. Sweet, rich liquors will play well with bread pudding -- stay away of anything clear or floral. More: While you've still got the bourbon out, mix up one of these -- it's five o'clock somewhere. 6. 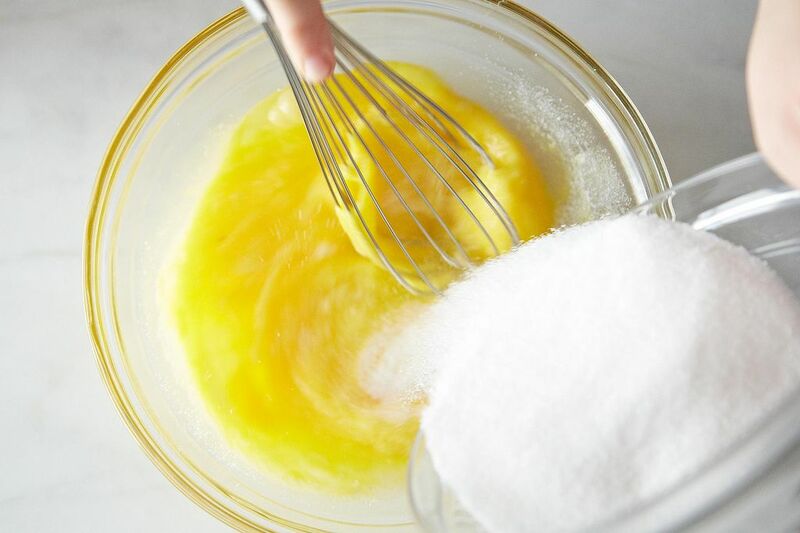 At this point you could toss in the grated zest of an orange, a teaspoon of vanilla, a splash of almond extract, or a pinch of cinnamon or nutmeg, if that's your speed. Feel free to try out any flavor combination that strikes your fancy, but as with many of the finer things in life, less is more. Stick to a few key flavors that work well together, and leave it at that. 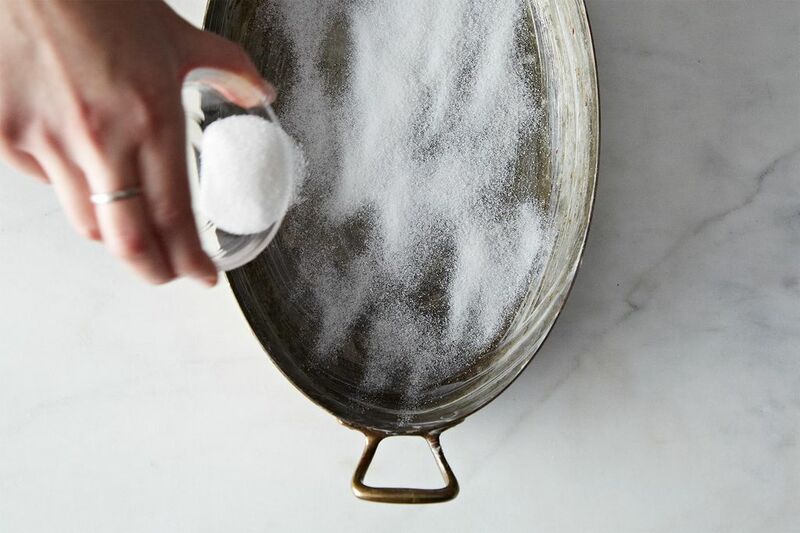 But before you do, don't forget a little touch of salt -- about a teaspoon's worth. This will add just enough contrast to your bread pudding to let the sweetness really shine, and will keep it from being too cloying. Never. Skip. The Salt. 7. Now it's time for everybody to get to know each other. 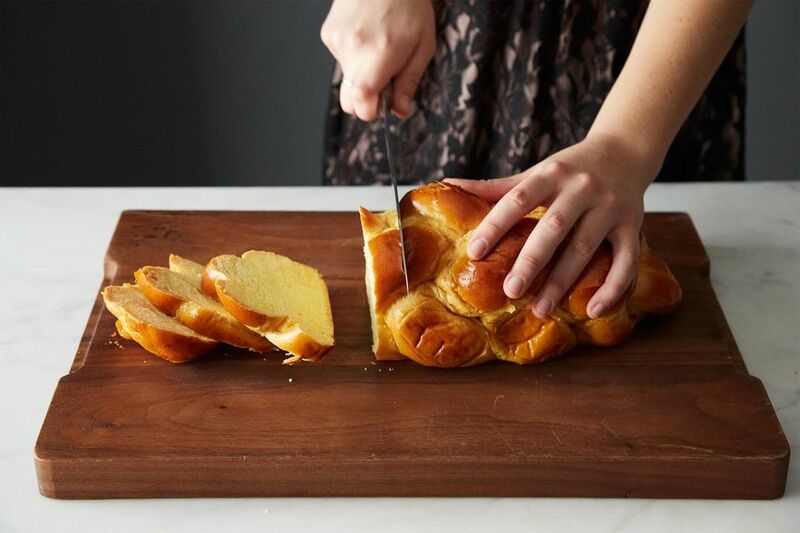 Pour your wet ingredients evenly over the bread, then toss to make sure everybody gets their fair share. If it seems like too much liquid for the bread to handle, don't worry -- you can adjust later. 8. Now's time to add your "chunks." 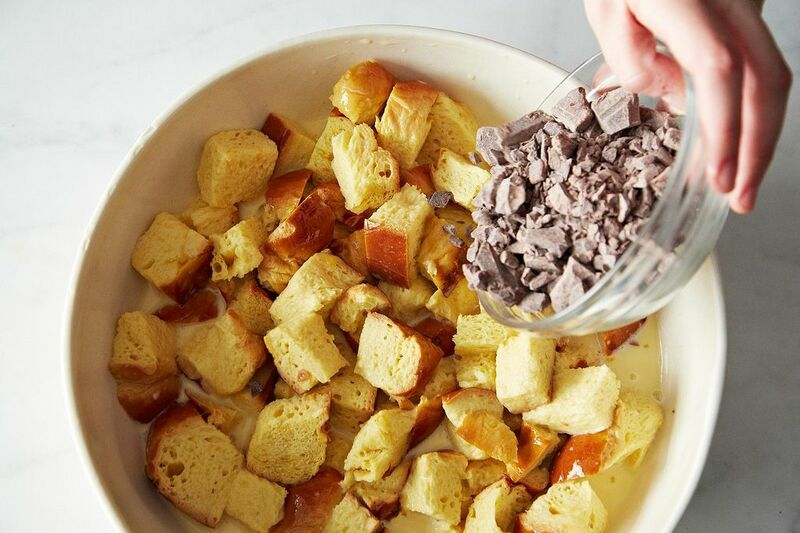 If you're not an ice cream or cookie chunk person, you will not be a bread pudding chunk person either. This is all right -- skip this step, and continue with your chunk-less existence. If you're a raisin person (who are you?!?!? ), add some in. If you're a nut (pun intended), throw some of those too. If you, like me, think most things in life would be improved with a good dose of chocolate chunks, you know what to do. Leave your bread mixture alone for 30 minutes so that the liquid has time to absorb and everybody starts to get along. In the meantime, heat the oven to 350° F.
9. Next, butter your pan. Yes, butter -- none of this non-stick spray nonsense. 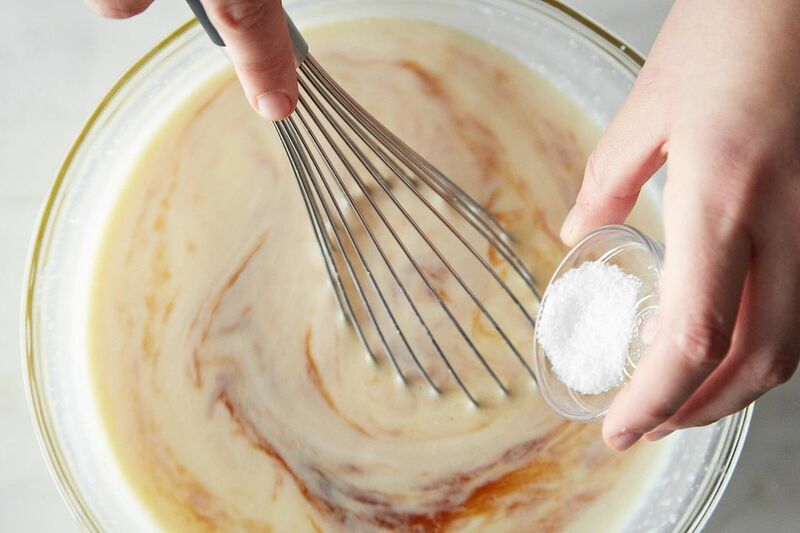 Now comes a super-cool trick: sprinkle your buttered pan with some sugar. 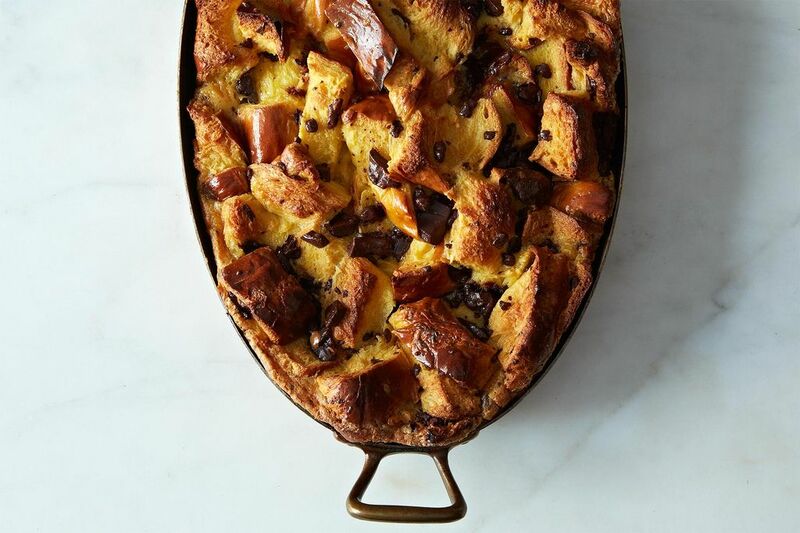 When you bake your bread pudding, the bottom will caramelize into a delicious, sticky crust. If you want more of a crunchy bottom à la lasagna, stick your sugared pan in the preheated oven for a few minutes until the sugar melts and begins to turn brown. Once this happens, take it out and pour in your bread mixture. 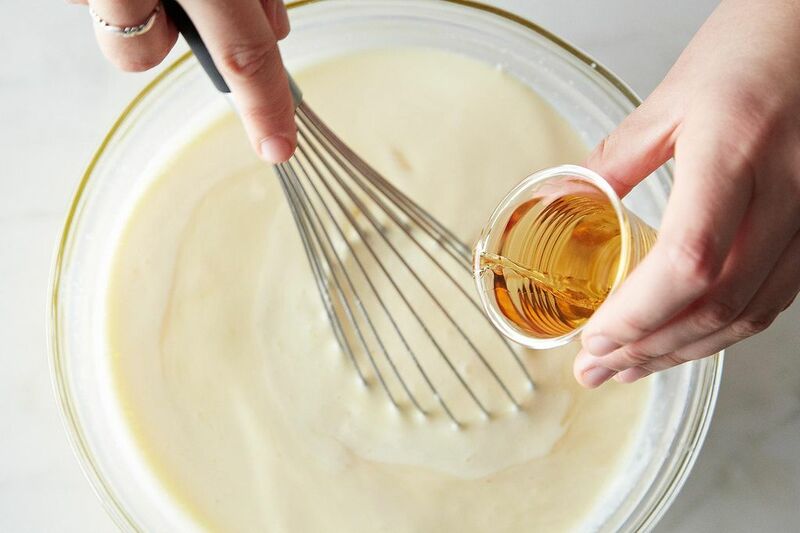 If there's an excess of liquid leftover, pour it over the top of the bread -- it'll turn into custard, which is never a bad thing. 10. 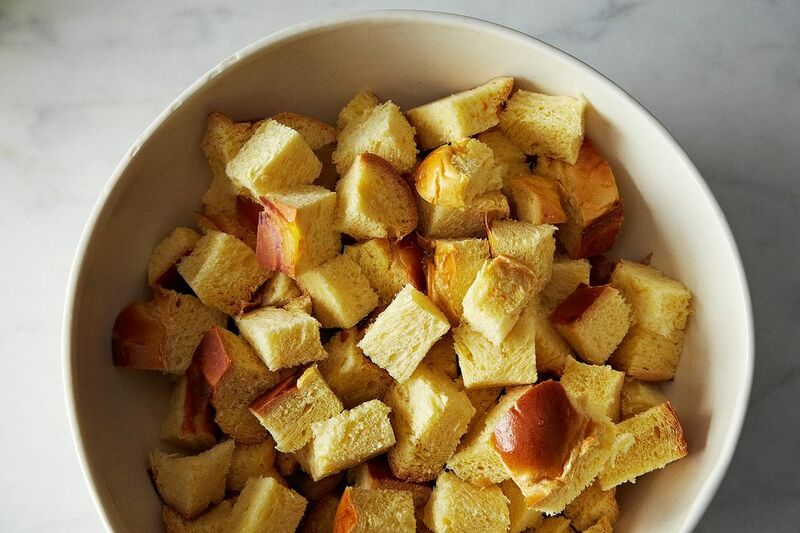 Bake your bread pudding until, when you pull it apart slightly with a fork, no liquid comes out. This should take about 30 to 45 minutes depending on the size, but start checking it after 20 minutes. If the bread browns too much, cover the pudding with tin foil and continue baking. Serve warm or at room temperature. Bread pudding is extra delicious when doused with crème anglaise, or the poor man's version: melted vanilla ice cream. May I mention that leftovers cold from the fridge are also an excellent breakfast? How do you do bread pudding? Share your tips and tricks in the comments below! This is not Bread Pudding - this recipe is for Bread & Butter pudding!! True Bread pudding is full of dried mixed fruit & has the consistency of an over-moist Christmas Cake..... made with overnight soaked stale bread, luxury mixed fruit, lots of mixed spice or Nutmeg & Cinamon & brown sugar ! I couldn't decide between a blueberry lemon bread pudding or a mixed berry & white chocolate recipe, so I combined them (heavy on the lemon zest & light on the white chocolate.) I followed your ratio for the dairy products. The pudding looked like it was made of dinosaur hide-purplish/grayish/blueish with strange white spots. But...it tasted fantastic-puffy & gooey & rich-and every single person at our Easter dinner loved it. Thx for the basics of bread pudding outline; it was unbelievably helpful. (I broke the rule & forgot the salt-bad idea- but the lemon zest counteracted the sweetness.) Yum. Love it! I like to do banana Nutella bread puddings. I first cook the bananas in butter and brown sugar of course. I want a pan like the one in the pic! Is it cast iron? Where can I find such a thing?!?!? Looks like a standard copper gratin pan. Expect to pay $150-$300. Available many places -- Amazon, Williams-Sonoma etc. Le Creuset also makes lovely gratin pans. Ebay might be a good source for used pans. Another pan, the Ruffoni copper gratin dish from William-Sonoma, is less expensive at $220, but has handles that are way too decorative for me (think acorns). Love it! I prefer savory bread pudding (as a decadent side dish) and have been searching for the perfect ratio. I typically use a royal custard ratio and it always comes out not... quite...right... I used your equal parts dairy to egg ratio (half cream/half raw whole milk) with leeks and pomegranate seeds to serve with seared duck breast. Perfect! I'm about to make a bread pudding from leftover Girl Scout cookie flavored cupcakes. They have a chocolate caramel ganache on top so I thought I'd add some additional chocolate chunks! I love bread pudding! My husband won't eat so I never make it. When we were first married I made some and he had a fit when I told him it was bepread pudding. I tried it again a few years later and called it raisin pudding and it didn't go over any better so I gave up. could i soak my bread in the custard mixture overnight and bake the following morning? Or will that affect the cooking process/texture of the final product? I've done this very thing and I would definitely suggest covering it in plastic wrap to prevent too much evaporation. I would also push the plastic down onto the mixture to keep it from forming a skin. Other than that proceed as per usual. I always check the center with a long skewer anyway. I love to use sweet rolls with fruit in the center. If I don't have any on hand I put a few spoonfuls of boysenberry or blueberry jam throughout the pudding before baking it. 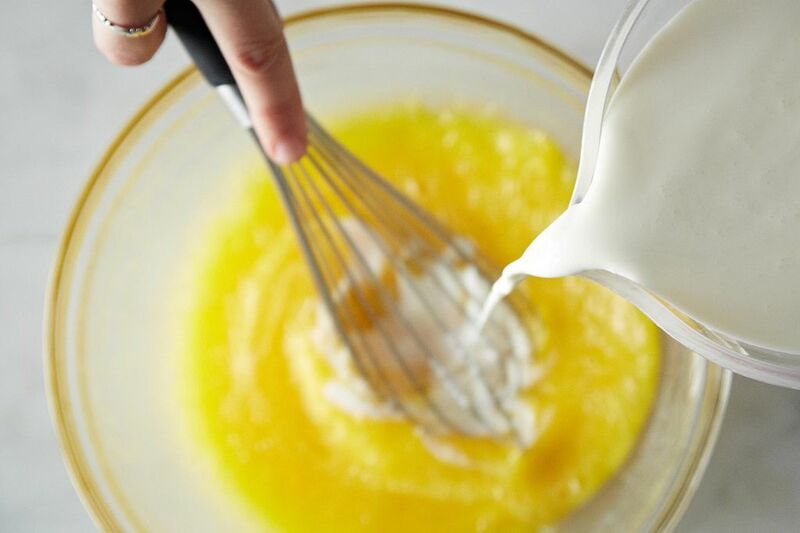 Love your idea of letting the mixture "sit" before baking it. Love the added little touches, like sugar on the bottom of the pan. I don't do bread pudding with a recipe, but now I'll keep your non-recipe in mind. First time at this site. Am I missing something? I can't email the recipe to myself to save it??? Hi Mary. You can email it to yourself at the top right of the article. There is a little grey mail/envelope button. Hope this helps. Never made bread pudding before I saw this recipe. Made it twice in the past two weeks. First time with Baltic bread and 3 eggs; second time with egg bread and 6 eggs. Both times with yogurt as the fat (love that this recipe says any fat you like!). Both times it was eggy, sweet, custardy, satisfying dessert, breakfast, treat. Great recipe! Thanks so much for posting it. Same here. I like to use Frangelico liquor in my caramel sauce, just lightly drizzled over the top. Combined with the freshly made caramel sauce it adds a great toasty hazelnut flavor. I followed above recipe adding a splash of almond extract, rum extract and vanilla extract. Half a up of white sugar and a half cup of brown sugar, pecans and dried cranberries. Melted butter in bottom of baking dish added some brown sugar popped it in the oven, then added my bread pudding and baked. Wonderful non-recipe! Do you just forego the sugar in a savoury version? Or do you need to replace it with something? I like to make pudding with panettone or fruit cake usually purchased on sale after Christmas. Looking forward to experimenting with savory versions of this formula, using up this and that from the fridge and pantry. The only thing as much fun as cooking without a recipe is knitting without a pattern!